Sheet Music from Rev. Charles Lewis Hutchins, Carols Old and Carols New (Boston: Parish Choir, 1916), Carol 419. 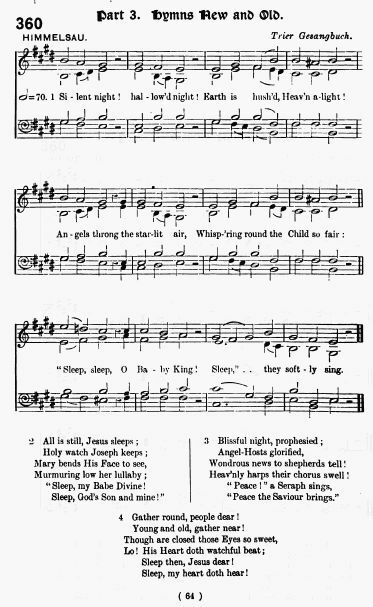 Sheet Music "Himmelsau" from J. F. W. Bullock and C. J. Ridsdale, eds., The New Office Hymn Book, Parts 3 and 4 (London: Novello and Company, 1907), Hymn #360, p. 64. According to Ian Bradley, in The Penguin Book of Carols, a version with the same title appeared in the Christian Hymn Book, 1865. 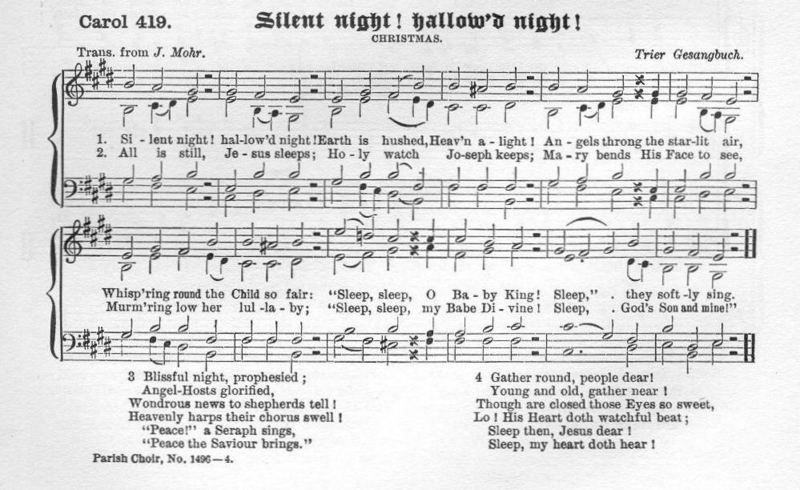 However, this is likely the version translated by J. F. Warner in 1849, Silent Night, Hallowed Night, which was edited by Alexander Campbell and published in 1865, 1866 and later years. A different version with the same name was recorded by the Haydn Quartet in 1905 (Victor 4511); it is available from The Dawn Of Sound. Another version was recorded by Olive Fremstad, Soprano, 3/30/11.